Artistic photographer, Jesper /yes-pur/ Widén /vih-dee-an/, sees inspiring geometry and balance in nature. His travel keepsakes are poignantly captured mementos for all to share. Jesper's past and present experiences help him see the world through a unique perspective. 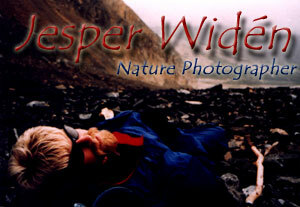 As trek leader, teacher, naturalist, writer, he makes time to sharpen his photographic skills. Jesper's artistic vision shines through in these lasting images.